Shiny blue suit for manwith vest. Blue satin lapel and 1 button in contrast. 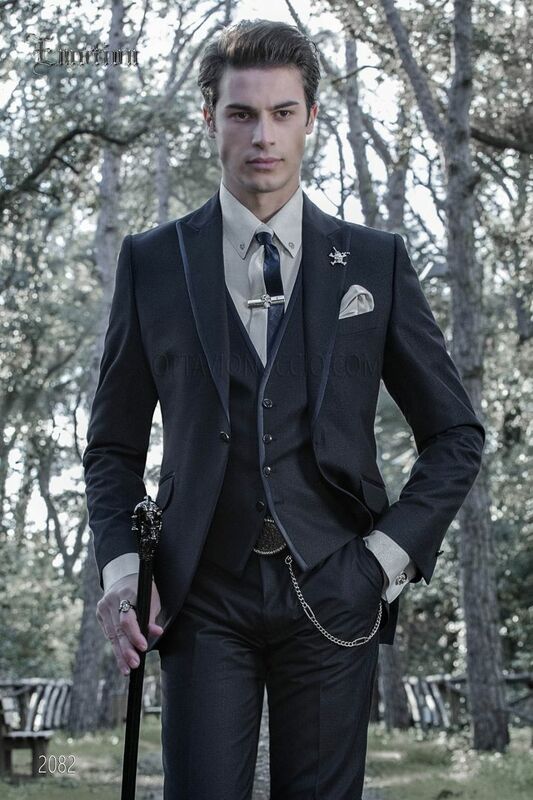 Peak lapel, flap pockets and angled buttonh... Shiny blue suit for manwith vest. Blue satin lapel and 1 button in contrast. Peak lapel, flap pockets and angled buttonholes, single vent at back. Rounded finish to stylize the figure and tail of jacket suitable for any height. Shirt made from pearl grey lurex with 'Emotion' collar. Silver skull appliqués on the collar and placket. Concealed plac... Shirt made from pearl grey lurex with 'Emotion' collar. Silver skull appliqués on the collar and placket. Concealed placket with buttons. Straight cuffs with skull-shaped cufflinks. Two-coloured 6.5 cm necktie in blue and pearl grey lurex with handkerchief Handmade. Nickel-tone tie clip with skull design and 'Ottavio Nuccio Gala' signature detail. Skull pendant made from nickel-tone metal.